From sharing a bedroom to building the best blanket fort ever, the Donco Econo ranch twin over twin bunk bed makes any kid's bedroom more fun. The clean, simple design is a fashionable fit for most any room, any gender, or any age. 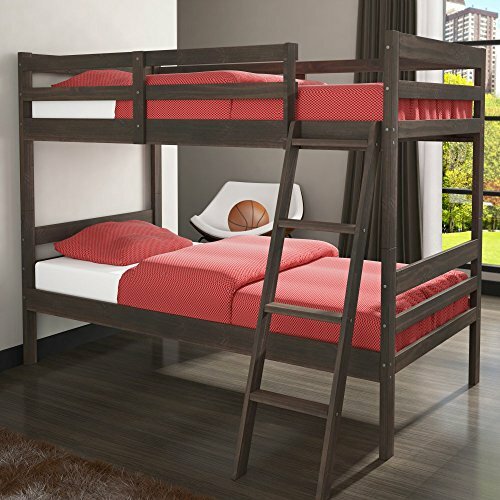 Solid wood construction is finished in a rustic walnut tone that's neither too light nor too dark, and the twin-over-twin bunk bed comes complete with top guardrails and a coordinating ladder. About Donco trading co. headquartered in Fort Worth, Texas, Donco trading company has made youth furniture their specialty. The family-owned and -operated business carries a full line of day beds, platform beds, bunk beds, and more - all reasonably priced. They distribute to and work directly with small business owners, specialty stores, and more in locations throughout the country. In addition to the Fort Worth office, they also have a distribution center in Kenosha, Wisconsin, and showrooms in Las Vegas, and high point, North Carolina. Additional limited-time savings reflected in current price. Dimensions: 77w x 42d x 61h in. Solid wood construction. Rustic walnut finish. Guard rails on top bunk. Includes ladder. Dimensions: 77w x 42d x 61h in.